1. Why did my power supply fail? 2. How do I repair the power supply? 3. Can I get extra channels? 4. Can I use an "Enhanced" LNB? 5. Can I upgrade to "Enhanced" menu software? 6. Can I upgrade my SS9200 to a twin input SS9200? 7. Are there any "secret" handset codes? 8. I get only "snow". What has happened? 9. Can I use a "Universal" LNB? 10. How can I tell how old my receiver is? 11. How can I download the memory? 12. Why do I get no decoder messages on screen? 13. Why do I get intermittent "Card Invalid" or "Please Wait" message? 14. Why do I get lines on the picture? 15. Why has the picture quality become poor? 16. Where do I get more information/get my receiver repaired? 17. Why doesn't my receiver work with pirate card/PC software? 18. Why can't I name channels 33 onwards? 19. Where did my menu go? 20. How do I control external devices? 21. How do I repair the broken tags on my front panel moulding? 22. Why do I get only one polarisation? 23. How do I turn the LNB voltage OFF in standby? C9 (1uF) dries out and often causes failure. The transformer T2 can go short circuit. These are the main causes, apart from mains surge. DO NOT REPLACE THE FUSE! It is there to protect YOU and the receiver. If you replace it you can make the damage worse and put yourself at risk! If the fuse has NOT melted, the cause is probably a broken track. All other causes make the fuse melt. If you replace the fuse without first repairing the PSU you will cause more damage. The copper tracks and pads are very fragile. Use fine "Multicore desolder wick®" - DO NOT use a pump-action desolder tool! Ensure normal safety precautions. If the fuse HAS melted, you will need the complete kit of parts. I'm not going to list them here because some of them are very special and you CAN'T buy them - especially R13 which must be a fusible 0R22 resistor (ordinary ones can make it unsafe). The SS9000 has 60 channels and can be upgraded to 90. A new microcontroller and EEprom are needed, so it's not cheap. The SS9200 has 90 channels and can not (so far) be upgraded. You can also fit an AutoSelect inside which will allow you to control an ADX automatically by selecting it in/out for each channel in the menu. The SS9000 menu will not allow you to tune high enough. You will miss out on the top channels. You can either upgrade to the 90 channel micro and EEprom or use an ADX. No, it doesn't exist but, if you upgrade to the 90 channel software and tune each channel 250 higher, you can use an Enhanced (9.75) LNB. Yes, it's possible, but the twin input tuner is expensive and you would have to drill an extra hole in the rear panel and file out the existing one. There are other changes to make, too. Not really worthwhile unless you have the twin-input tuner already. Setup, P, 2, 3, Store, UP arrow, DOWN arrow. BEWARE! on early SS9000 receivers with a microcontroller ending in "25", or "26" you will find that channels 25 to 32 have their polarisation reversed. You will need to change each one from H - V or vice-versa. If you take your receiver abroad, you will need to change the RF modulator output from "PAL I" to "PAL G". This is simply achieved by pressing SETUP, MUTE, NORM, STORE, [up arrow], STORE (and the same to reset it back to PAL G). On the 90 channel version the microprocessor output which controlled this PAL selection is, instead, used to select the internal decoder automatically via the rear pin of the 10 pin connector. In standby, press STANDBY then STORE and hold STORE for twenty seconds. During this time the channel ident should remain in the top right corner of the screen, otherwise press NORM and try again. Hold STANDBY, UP and DOWN buttons on the front panel, simultaneously, and restore mains power. Release the buttons. Remove mains power from unit. Hold STANDBY button and restore power. Release STANDBY button after 3 seconds. Press 'Setup' followed by 'AUX/0'. Presumably there is no signal. The most obvious cause is that your LNB is not connected. Sometimes LK210 near the front (0.47 Ohm or 18uH inductor only in later SS9200) has burned out because you short-circuited the input. There are many more faults which will cause this symptom. 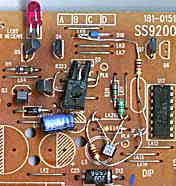 Later SS9200s with a Sharp tuner sometimes do this because a resistor was omitted. Unplug the receiver from the mains and plug it back in. If the pictures return, you need to fit a 27k resistor from C134 + leg to LK202 nearby. A "Universal" LNB will work exactly the same as an "Enhanced" LNB unless your receiver incorporates 22kHz tone switching to access "High Band" frequencies. The 22kHz tone switches the LNB internal oscillator from 9.75 GHz to 10.6 GHz. SS9xxx receivers do not incorporate this feature but it CAN be added. A kit is not available but you can build it yourself on stripboard. But first consider why you want to use a Universal LNB. What do you expect to receive on High Band? Or do you want the tone switch in order to utilise an external switcher box? The date of manufacture is incorporated in the serial number. The "24" indicates week 24 counting from first week in January. In the 60 channel version you have to select "AV INT" and "DECODER INT" in the menu for each scrambled channel. Pressing the factory reset sequence will change most channels back to "AUTO" which is fine for the SS9200 but not for the SS9000. The SKY card seems prone to this on certain receivers. Make sure that the card contacts are clean and the card slot spring contacts are clean and not bent or twisted. Intermittent messages can also be caused by a poor signal (see the "sparklies" FAQ) or tired capacitors (fit RELKIT) or a faulty Sky Card. If these are dashed lines swirling across the picture, more evident on decoded channels, then the cause is C29 (right hand edge of main board). It must be replaced with a 100uF (or higher) 35v (or higher) 105'C LOW ESR capacitor. If the lines are NOT present on the picture from the Decoder Scart then there is a problem around the TEA2029C chip. Possibly the chip itself or the 4u7F capacitor next to it or a dry joint underneath. If the lines totally obscure the picture on ALL outputs (check!) when the receiver is warm (maybe looks like a scrambled picture) then the culprit is the tiny 2u2F electrolytic inside the tuner module. Desolder the tuner and prise the side covers off (you can discard these to keep it cooler). VERY carefully, remove the tiny cylindrical capacitor C416 and replace it with a 2u2F tantalum bead type of 6v3 rating (or higher). Observe polarity ("+" leg furthest from the metal side). Use VERY fine solder and solder tip to do this. Be extremely careful because it is easy to destroy 40 quids worth of tuner! Replace the parts mentioned in 14. If the picture is streaky, you need to replace several electrolytic capacitors. These MUST be low ESR, high temperature 105'C type or you'll make it worse! Start with the large capacitors at the front of the power supply. C21 and C25 are prime suspects. After that, replace ALL the electrolytics at the front of the PSU. Then replace the 1uF and 10uF capacitors near the tuner (these get hot) working outwards in a circle. (The darkened ones near the Scart connectors carry mostly audio so ignore them). Also, spray the decoder connector with WD-40 and work it up and down a few times to clean it. You might find that the decoder messages are now darker when you power it up. A reliability upgrade kit is available from SatCure. Also a power supply repair kit. 16. Where do I get more information/get my SS9xxx repaired? The facility to name channels on the SS9200 is available only for the first 32 channels. Unfortunately, the amount of memory can not be expanded for the remaining channels. For 60 channel models press [SETUP]    and for 90 channel models press [SETUP] . If no menu appears then you have locked channel zero which disables the menus. Unlock channel "0" or use the factory reset sequence. If there are ALSO no channel idents then U9 may be faulty. After you've gotten the menu on screen, look for the top line that gives the tuned frequency and either punch the desired frequency in using the handset number buttons or simple scan the frequencies using the up and down buttons until you find the programme that you want. The second line sets the polarisation voltage to either 13 volts (V) or 17 volts (H). To navigate through the menu, press SETUP to go down a line or press STATUS to go up a line. Press STORE twice to save the changes to the same channel number or press STORE then the channel number (using the P-- button if more than single digit) then STORE. To get the second menu screen keep on pushing SETUP or STATUS until it appears. To get the INSTALLATION MENU press [SETUP]  or [SETUP]   . You can then adjust the global frequency offset to match your LNB in order to get rid of either black or white sparklies on every channel. The LNB type should be selected as FSS unless you are using a Telecom Band or other LNB. Two software switches are available in these receivers. The first is the PAL/MAC selection in each channel menu. The switching voltage is available on link LK31. The second is the LNB1/LNB2 selection. To enable this in single-input receivers, connect a 4k7 resistor from link L28 to link LK15, LK12 or LK18 (5 volts). The option will now appear in the menu. The switching voltage is available on link LK28. In the case of an internal 22kHz tone switch, remove Q3 (17 volt switch) and D17 (13 volt feed). Take 18 volts directly from D15 cathode (Q3 emitter) to the 22kHz tone switching circuit which must also be capable of switching 13/17 volts. The 13/17 control comes from the base of Q3 (junction of a 1k and a 10k resistor) which will go low for 17 volts selection. Use a soldering iron to melt a paperclip into the remaining part of the tag, as shown in this picture. Simple! Assuming that your LNB and cable connections are good, the most common fault is failure of Q3 (An FXT749). This is rated at 1 Amp so you must fit the same type! Measure the LNB voltage which goes into Q3 and comes out of Q3 to see what is happening. Q3 usually goes short-circuit but occasionally goes open-circuit. Another cause is a broken copper track nearby. Also check Link LK210: sometimes a 4R7 resistor or an inductor is fitted instead of a wire link. You can fit a link. 22. How do I turn the LNB voltage OFF in standby? Most satellite receivers run too warm for their own good and my SS9200 was no exception. I had already fitted the reliability upgrade, RELKIT 2 and mounted the receiver on an open shelf, but still it felt very hot to the touch. Pace receivers continue to supply current to the LNB, even in standby. The original reason was to protect the LNB from sudden temperature changes. Amstrad receivers and a few other makes turn the LNB supply off in standby so I could see no reason why my Pace shouldn't. Since most modern LNBs require 200 - 250mA at 13 volts, the power saving would be significant. In addition, nobody would be able to send a signal to my smart card while the receiver was "off". A simple modification to the receiver will cause the LNB voltage to be switched to zero in standby. The sketch shows the position of the components. All you need is two 1k� resistors and an FXT749 transistor. This PNP transistor is critical because its rating is 1 Amp with a very low voltage drop in a tiny "e-line" package. Fitting is simple. You don't even need to remove the board from the chassis. Solder the transistor across LK210 with its collector (centre leg) near U17 and emitter near C200. Now cut out LK210 and discard it. (LK210 might be a wire link, a resistor or an inductor, dependent on model type). Solder a 1k� resistor between base and emitter of the FXT749 transistor. Finally, solder the second 1k� resistor between the base of the FXT749 and the cathode (bar) end of diode D18 which is near the front edge of the board. This connection goes high in standby, turning off the FXT749. Secure the resistor, diode and wire with glue to ensure that they can't touch anything and cause a short circuit. With my receiver there was a significant reduction in heat from the power supply but, if you insist on keeping yours in a nice warm cabinet on top of a video recorder or, if - as with most modern houses - your room temperature is quite high, then you might also consider fitting the miniature cooling fan kit.